Mr. Juergens is associate editor of Pensée. This paper is an extension of his presentation to the McMaster University symposium, "Velikovsky and the Recent History of the Solar System," June 16-19, 1974. The first part of this paper (Pensée, Fall, 1974) was devoted primarily to an argument that sinuous rilles, features peculiar to maria surfaces on the Moon, are of electrical origin. It was suggested that these tortuous "riverbeds" were produced instantly and explosively as subsurface formations succumbed to electrical stresses, and that the youngest of them resulted from an encounter between Mars and the Moon. Electrons thus torn from the lunar crust pioneered paths in space along which powerful discharges transferred electric charges between the two bodies. It was further suggested that the energy delivered in just one such discharge was sufficient to create, and probably did create, the large explosion crater, Aristarchus. There are several other lunar surface features that seem best explained as electrical scars. But before taking a look at them we may usefully ask how much electric charge might have been exchanged in the postulated Aristarchus event. Would this charge, for example, be a reasonably small fraction of the total charge carried by each of the two planetary bodies involved? Suppose we approach this problem by taking the measure of an ordinary lightning bolt, which hopefully is the nearest thing to an interplanetary discharge likely to be observable in our time. The energy of a fairly average lightning discharge, according to Viemeister (59), is about 250 kilowatt-hours—roughly 9 x 108 joules. On Earth, most of this energy is dissipated in the atmosphere. But what might happen if such a bolt were to strike an airless body like the Moon? 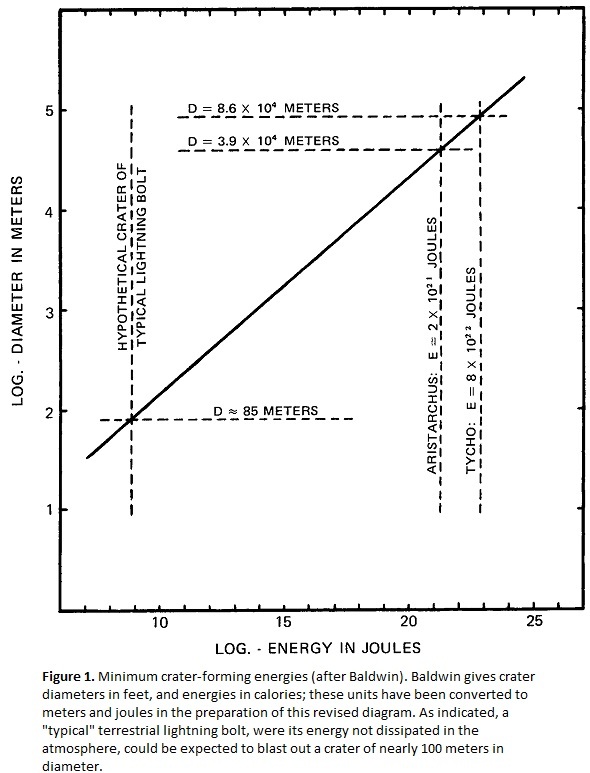 From Baldwin's analysis of lunar and terrestrial explosion craters (60), it would appear that such a bolt ought to produce a lunar crater about 85 meters in diameter (see Figure 1 ). Aristarchus, as indicated in the figure, was probably formed by an explosion releasing some 2 x 1021 joules of energy. So we are talking about an interplanetary discharge a few million million times as energetic as ordinary lightning. Cloud-to-ground electric potentials in thunderstorms reach values near 109 volts (61). Presumably the potential drop across an interplanetary spark gap would be considerably greater than this, but by how much we can only guess for now. Let us assume that it would be at least a thousand times greater—say, 1012 volts. On this basis, since the energy of a discharge is the simple product of the potential drop between electrodes and the total charge transferred, we can estimate that a spark transferring 109 coulombs of charge would suffice to produce an Aristarchus on the Moon and wreak corresponding havoc, though of a different kind, on Mars (62). to large degree, the potentials of all the planets (or at least the inner planets of the system) should be pretty much alike and equal to that of the Sun. Nor need one put too much stress on Bailey's estimate of the Sun's net charge. Most of his arguments assume that electric fields propagate across interplanetary space, and this seems ruled out by the plasma. Nevertheless, for present purposes we might take Bailey's figure as a minimum value for solar charge and deduce from it a minimum value for the Sun's surface "potential"-1019 volts. On this basis, then, since the plasma effectively "grounds" the planets to the Sun, each of them ought to be charged so as to have this same 1019-volt surface potential. The charge on each of them, expressed as a fraction of the Sun's charge, should be proportional to the planet's radius, expressed as a fraction of the Sun's radius. Earth, Mars, and the Moon should then carry respective "normal" charges of approximately 1015, 5 x 1014, and 2.5 x 1014 coulombs. Given such charges—and it bears reemphasizing that these figures may be substantially on the low side—we can see that the postulated Aristarchus discharge, transferring 109 coulombs between Mars and the Moon, would alter the "normal" charge of Mars by only about two parts in a million, and that of the Moon by some four parts in a million. Quite a few such bolts might pass between the two bodies during a single encounter without significantly affecting the electrical balance between either of them and the interplanetary plasma. But of course Aristarchus and craters of similar size are by no means the entire story. 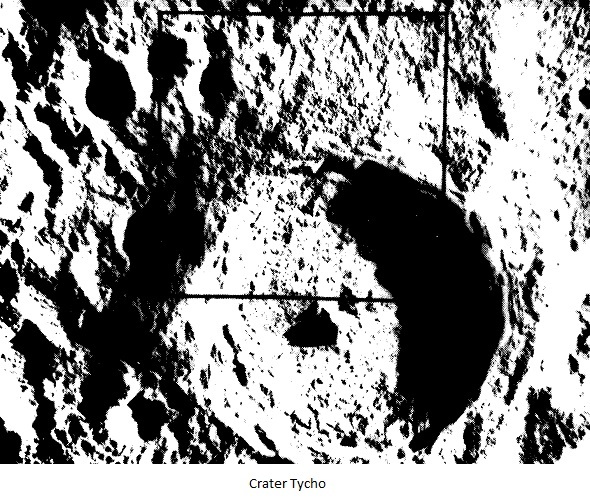 The crater Tycho in the Moon's southern highlands gives every indication of being one of the most youthful of lunar features; indeed, Shoemaker et al. (66) consider it even younger than Aristarchus, but this solely on the basis of geologic considerations that may not apply to a Moon involved in near-collisions only a few thousand years ago. In any case, as Hartmann and Yale stress (67), Tycho and Aristarchus are the only two among the larger craters on the Moon with floors of bare rock, unlittered with debris from later eruptive events in their neighborhoods. This would seem to put both in the same age bracket—one of extreme youth. Observations indicating that Tycho is a persistent "hot spot" after sundown on the Moon (71) and that it is a strong reflector of radar beams (72) support the conclusion that its floor is remarkably clean. They also suggest that the flows observable in Lunar-Orbiter photographs are of congealed, lava-like material. And this may be taken as further evidence in support of the discharge hypothesis of Tycho's origin. Explaining a crater floor of bare, once-molten rock in terms of the conventional impact theory is a little difficult. One must resort to ad-hoc theorizing to the effect that something—perhaps the shock of the postulated impact explosion—melted a considerable volume of rock at some depth, and that following the explosion this material welled up to engulf the crater floor and flow around obstructions encountered there; otherwise, debris from the explosion itself could be expected to clutter the crater floor (73). Impact theory offers no reason, however, to expect such a sequence of events, and nothing in terrestrial experience with crater-producing explosions supports the idea. Tycho's position in Figure 1 shows that the explosion that produced it, whether attributable to impact or to electric discharge, must have been perhaps 40 times as energetic as the Aristarchus event. Assuming that the explosion resulted from an electrical strike and that the driving potential (spark-gap voltage) was of the order of 1012 volts, we are led to conclude that the Tycho bolt must have transferred something approaching 1011 coulombs of charge between Mars and the Moon. But even this amounts to only a few parts in ten thousand of our estimated "normal" charges on Mars and the Moon; the electrical balance between either body and the undisturbed interplanetary medium would be only negligibly affected. But if Tycho, like Aristarchus, is a cathode crater, where are the sinuous rilles that might be expected to have provided triggering electrons for the Tycho discharge? Should not such features be tens of times more abundant around Tycho than in the area of Aristarchus? We have already noted the fact that sinuous rilles occur only on mare surfaces. And Tycho is located in a highland region, hundreds of kilometers from the nearest mare margin and even farther from the nearest evidence of sinuous-rille activity. Could a Martian spark to the Tycho site have been triggered in another way? The rays of Tycho constitute a centuries-old puzzle that has defied solution in terms of conventional thinking about the history of the Moon. Velikovsky's demonstration that Earth's satellite, like the Earth itself, actually has a recent history—a natural history—and that this history has been punctuated by episodes of interplanetary violence, puts the Tycho-ray puzzle—like many other astro-geological problems—in an entirely new light. In this instance, Velikovsky's work suggests that astronomers, selenographers, and astrogeologists alike may have been searching in too few compartments of scientific knowledge for clues to the puzzle's solution. To judge from the preponderance of recent literature, today's majority opinion is heavily in favor of the idea that lunar-ray systems originated in the ejection of materials from central craters. And Tycho's long rays, some of them reaching so far as to pass out of sight beyond the limb of the Moon's visible disk, are considered exceptional but still explainable as ejecta from Tycho itself. Ralph Baldwin, a leading advocate of this view, mocks those who would seek other explanations: "There must be something about the moon which causes astronomers and others to suffer severe attacks of imagination" (75). He refers specifically to ray-origin suggestions ranging from an efflorescence of mineral salts along radial cracks, or an expulsion of ice crystals through openings in crater walls, to an emission of lava along tectonic fractures, or an ejection of volcanic ash in extraordinarily straight, evenly spaced streams. His answer: The rays are simply rock flour jetted outward by impact explosions. Now, obviously, some of the ideas Baldwin takes exception to are pretty far-fetched. But their common inspiration is just as obviously the many difficulties that plague the ejection hypothesis. For one thing, the rays have no discernible depth. Surely materials squirted laterally from any explosion site would at least occasionally fall more heavily in one place than in another and build up substantial formations. But no one has ever been able to point out such a ray "deposit." Another difficulty concerns the fact that the rays are scarred with numerous small craters. Baldwin's explanation is that "some solid material was shot out with the jets and produced 'on-the-way' craters" (76). But Kopal pointed out some years ago (77) that the total volume of material of this type alone, if called upon to explain the secondary craters along Tycho's rays, would amount to some 10,000 cubic kilometers—an amount of material entirely inconsistent with careful measurements indicating that practically all material excavated from Tycho's crater has been deposited in its rim. Furthermore, Ranger photographs suggest that on-ray craterlets may be even more abundant than either Baldwin or Kopal thought likely. Baldwin, writing at a time when only Earth-based telescopic observation was possible, noted that "when these rays are closely studied, they are found to be composed of long, narrow, elliptical sections, often with a small crater or elongated groove in the white region" (78). But after examining the Ranger photos, Shoemaker commented (79): ... . . . many small secondary craters, too small to be resolved by telescopes on earth, occur at the near end of each ray element." Thus not only the presence of the secondary craters in connection 'with "each ray element," but their placement, always "at the near end," poses a problem for the ejection hypothesis. Is it conceivable that larger objects randomly mixed with fines in ejecta streams would always manage to drop to the surface just at the inner ends of fallout patterns produced by the fines? The strange proportions of Tycho's long rays seem all-but-impossible to reconcile with ejection origins. Enormous velocities of ejection must be postulated to explain the lengths of the rays, yet the energetic processes responsible for such velocities must be imagined to be focused very precisely to account for the ribbon-thin appearance of the rays. Early in this century Pickering reviewed the ray-origin ideas then abroad and found them wanting (80). He suggested: "Another and perhaps better explanation is that electrical repulsion . . . . furnished the radial force which caused the arrangement [of Tycho's rays]." It was his personal observation that "those streaks which do not issue from minute craterlets lie upon or across ridges, or in other similarly exposed situations." Although he was none too specific as to the details of an electrical mechanism that might explain Tycho's rays, he drew an interesting comparison between the suggested phenomenon and "auroral streamers." I think that in this case Pickering was indeed on the right track. Before pursuing the point, however, suppose we take a close look at the entire Tychonian system. Shoemaker et al. (81) give us this description of conditions just outside the rim of the crater: "The exterior flank of the rim . . . . comprises a belt of terrain 80 to 100 km wide that differs from the surrounding highland terrain in , topography, albedo, radar reflectivity, thermal characteristics, and other physical properties. This belt is underlain by a complex sequence of rim deposits. They are divisible, on the basis of both topography and albedo, into distinct geologic facies, which form a series of three concentric rings around the crater . . .
"The inner ring [which] extends from the crest of the crater rim a distance of 5 to 10 km down the rim flank . . . . is characterized by irregularly hummocky topography and a normal albedo of 16 to 17%. Within this ring are many well-developed flows, some as long as 8 km. . . .
"Surrounding the dark-halo facies is a third major ring characterized by abundant secondary or satellitic craters.... Beyond the third or outer ring, the rim deposits are discontinuous and grade outward into the ray system. "The Tycho rays consist of a discontinuous series of bright streaks. In more distant parts of the ray system, the streaks lie nearly along great circle arcs that pass through the parent crater. Close to Tycho, the pattern is more complex and includes broad, roughly linear, bright bands and numerous bright ellipses and loops. But do the long rays—all, or even most of them—actually "pass through the parent crater?" Another point that has long troubled the ejection hypothesis of ray origin is the readily observed fact that Tycho's long rays do not diverge from the center of the crater, although such divergence would be expected for material thrown out by a point explosion. It is often said e.g., (82) that the rays are tangent to the crater rim, and various ad hoc modifications of the ejection hypothesis have been offered to explain, or explain away, such a peculiarity in ray alignment. As a matter of fact, however, the briefest examination of good photographs of the full Moon indicates that only a few rays are "tangent to the rim of the crater," while others seem to point directly to, or through, the center of the crater. Close scrutiny of the long rays suggests that they actually may diverge from a common point, or common focus, located on or buried beneath the western (83) rim of the crater. But Tycho's shorter rays-those which fill the inner regions of the gaps between the long rays and appear to be quite similar to the rays of other craters, such as Copernicus, Kepler, and Aristarchus—seem to diverge from Tycho itself. Could it be that we have here two systems of rays, one superimposed on the other? Such a situation would be consistent with the known behavior of certain electric discharges. In the first part of this paper (note 12), it was suggested that the bright rays associated with lunar craters, recognized some years ago by Velikovsky as electric-discharge markings (84), are Lichtenberg figures-starlike patterns produced when electric sparks terminate on non-conducting surfaces. The proportions of Lichtenberg figures are determined by such variables as the polarity of the surface with respect to the discharge, the magnitude of the impressed voltage (the potential drop across the spark gap), and the abruptness of the wave front in the flow of current (85). Positive figures-those produced where positive charges touch down, as on a non-conducting cathode are generally more distinct; their patterns are more obvious, and for a given impressed voltage they are larger than negative figures (86). Since Lichtenberg figures result from the breakdown of gases immediately adjacent to surfaces (87), they increase in size both as the spark-gap potential goes up and as the ambient gas pressure goes down (88). Thus, at atmospheric pressure on Earth, a 1000-volt positive figure might be only a centimeter or so in diameter, while one produced by a 100-million-volt lightning bolt might be meters in diameter; features of the latter proportions are occasionally seared into exposed lawn surfaces. On the Moon, where the ambient gas pressure, even during an encounter in which the atmosphere of Mars might be partially drawn into the gap prior to the onset of electrical displays, would scarcely be significantly greater than that of interplanetary space, a bolt striking with a driving potential of several million million volts might well produce a Tychonian ray system. Lichtenberg figures, though they have been known for several centuries and have been employed to practical advantage in various ways (89), are far from completely understood. The essential function of the process that results in a positive figure, however, seems to be one of assembling electrons. Because the surface receiving the electric spark is non-conducting, the electron-collecting mechanism takes the form of breakdown streamers in atmospheric gases in contact with the surface. 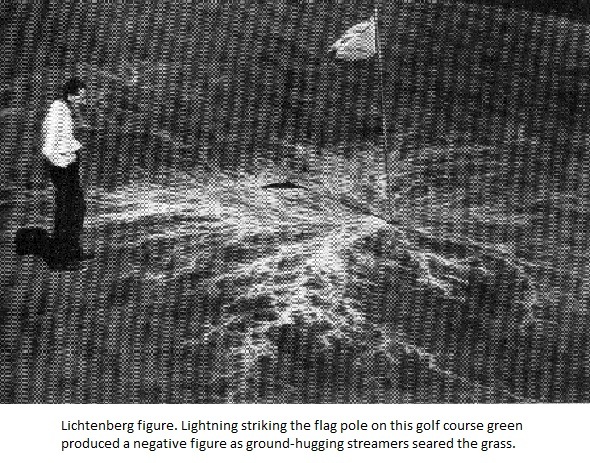 By means of strong electric fields associated with concentrated space charges at their outer tips, these streamers propagate outward literally at "lightning speed." At the same time, they are held to the surface by the electrostatic attraction between their tip charges and those they seek to extract from the surface. And, although they originate at a common point where there exists an intensely concentrated field, they are able to extend that field far beyond its initially effective reach in all directions-again by virtue of the strong field at their tips (90). 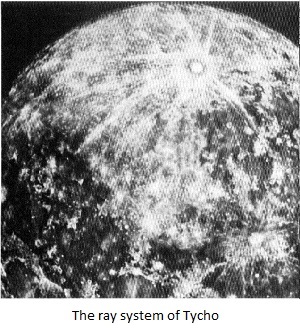 Now, suppose that Tycho's rays actually constitute two systems: A primary system of long, narrow rays diverging from a point just outside the crater; and a secondary system of much shorter, much more diffuse rays that actually focus upon and are more intimately associated with the crater itself. The visual evidence seems to support this idea, and the local absence of sinuous rilles seems to require it: The long, primary rays would be needed to trigger a discharge to the general area; the more concentrated secondaries—counterparts of the rays of Aristarchus-would be needed to pinpoint the actual site of the strike. Interestingly enough, E. Nasser and D. C. Schroder, of the Iowa State University Department of Electrical Engineering, have published a report on spark studies indicating that just such a composite system of rays might be expected where there is no other practical means of assembling triggering electrons (91). This report is illustrated with an "autograph," a Lichtenberg figure recorded on photographic film, showing a less-extensive, secondary figure superimposed on a more-extensive, primary figure. The authors describe their autograph, obtained by placing the photographic film where it would intercept cathode-directed spark streamers, this way: "The usual radial primary streamer pattern is in evidence but superimposed on this are the traces of secondary channels . . . . [which] branch more extensively and have associated with them a very dense net of filamentary 'threads' which leave a circular pattern of traces. The trunks of the secondary channels often form along the path of a primary streamer, but they have been observed to form between primary streamer traces also. The branches of the secondary streamer traces often cross primary traces and the secondary streamer growth would appear independent of the particular paths chosen by the primary streamers. The fine filamentary tips of the secondary streamers seem to propagate in a circular pattern.... Although the filamentary traces do cross, the general pattern indicates that they tend to repel each other." Nasser and Schroder interpret their primary streamer traces as effects of a mechanism assembling electrons that triggered the spark event, but their analysis shows that the "secondary channel mechanism . . . . is responsible for creating the highly ionized path along which the spark channel develops" in the gap between the electrodes. In other words, the primary streamers set the stage for a discharge to the area in question, while the secondary streamers selected the precise point of touchdown for the main-stroke spark. If this is what happened at the Tycho site on the Moon, then it is misleading to refer to Tycho as the "parent crater" for the rays; instead, the secondary rays must be considered the parents of the crater, and perhaps the primary rays the grandparents. • The external electric field due to the nearby presence of Mars was locally intensified by the high ground at this site. The center of a radial ground field that resulted was probably a pre-existing peak of ground that now lies buried in Tycho's western rim. • The radial field was unable to produce breakdown in subsurface formations by the sinuous-rille process, and as a consequence the field intensified to a point where breakdown was initiated in the thin lunar atmosphere. • Instantly, breakdown streamers began to propagate in all directions, generating electrons "the hard way." As the intense fields at the streamer tips passed over susceptible geologic formations, electrons were exploded from the ground, and on-ray craterlets were born; the fines from each little explosion were carried along for some distance and deposited in an elliptical patch by the "wind" force of the plasma streamer. • Small-scale branching of the primary streamers locally broadened the rays, and occasionally led to the splitting of rays, but the force of the guiding field and repulsive forces between the rays kept them generally straight and narrow. • As the spark streamer from Mars approached, the lunar atmosphere again broke down. Secondary Lichtenberg streamers fed electrons from proliferating local eruption craters toward the new focus of the field, thus determining the precise touchdown point for the Martian streamer. • Finally-again, all this probably happened in a minute or so—the Martian streamer bridged the interplanetary gap, and the crater Tycho was born in the resulting explosion. Material thrown from the crater blanketed the outer slopes of the crater rim, itself formed largely of material shoved laterally, creating a dark ring that obliterated the brightest parts of the secondary ray system. Thus the visual evidence suggests that triggering electrons for the Tycho discharge were assembled by means of an atmospheric-breakdown process that drew them from numerous distant points in all directions and hauled them over the surface to a common collection point. On the far side of the Moon are several more long-rayed craters (92), presumably marking sites where much the same thing happened; these, too, are located in highland terrain. Now let us take another look at Tycho's primary rays. Though some of them pass out of sight to the far side of the Moon, it is readily apparent from those that run their courses entirely on the visible hemisphere that ray lengths vary considerably. Also, there is a wide variation in brightness and width from one ray to another, and even between different reaches of single rays. When these characteristics are examined in conjunction with Baldwin's lunar contour map (93), an interesting point emerges: The brightest, widest rays, and the brightest, widest parts of individual rays, seem to be those traversing the highest ground. All rays appear to narrow as they approach mare margins, and some of them terminate abruptly at such points. If we assume, on the basis of reports by careful visual observers (94), that ray prominence (or brightness) and width is a reflection of ray-element abundance, we are led to conclude that there is a correlation between ground elevation and ray-element abundance. This recalls Pickering's observation, already noted, that ray elements show a preference for "exposed situations." A proliferation of ray elements could well be explained in terms of the natural tendency of electric fields to become intensified by projections from surfaces; the Moon's highland terrain is notably more rugged than the lowlands. An abundance of stress concentrations induced by the approach of a charged streamer tip could be expected to promote streamer branching and thus increase the sprawl as well as the density of craterlet eruptions and ray elements. But this does not seem to account for the narrowing of rays as they approach the edges of lowland plains; highland terrain at lower elevations is probably just as rugged as at higher elevations. Part of the narrowing, presumably, is attributable simply to distance from the initial breakdown point; a corresponding narrowing with distance is evident in sinuous rilles. But perhaps atmospheric density at ground level has something to do with the effect, too. The lunar atmosphere is everywhere extremely tenuous. Nevertheless, some variation in density with altitude must exist, and the extraordinary broadening of rays at high altitudes and the narrowing at lower altitudes may indicate that streamer-branching was promoted as much by lower gas densities as by surface roughness. But why atmospheric breakdown in the first place? Why should one process—sinuous-rille eruption—provide primary electrons for spark-ignition in lowland regions, while another process—breakdown in the Lichtenberg mode—does the same job in the highlands? The fact that long-rayed craters are so few necessarily limits confidence that can be placed in any answers to these questions. Nevertheless, since sinuous rilles are confined to mare surfaces and long rays seem to be associated only with craters located at considerable elevations above spherical datum, and since there is reason to suppose that both types of feature were produced by triggering events leading to interplanetary discharges, perhaps some speculation as to the implications of this dichotomy is in order. Presumably, topographic intensification of an external electric field would be much the same on one part of the Moon as on another. Consequently, the intensities of radial ground fields thus induced should also be comparable. It would seem, then, that if the mode of triggering differs radically between the two locations, the difference must reflect the relative dielectric strengths of materials at the two sites. The present hypothesis suggests that in lunar maria breakdown occurred preferentially in coherent rock formations at shallow depths beneath the regolith, or surface mantle of fractured rock. In the highlands, on the other hand, electrical stresses of equal or perhaps greater intensity failed to achieve a similar result, and nothing much happened until field strengths increased to values sufficient to initiate breakdown in the overlying atmosphere. When this happened, fields of even greater intensity at streamer tips apparently did manage to break down surface materials, but only locally, producing small craters instead of rilles. What kind of damage might the planet Mars be expected to sustain from episodes in which electric discharges passed between it and the Moon? Under the postulated conditions, therefore, Mars, as the anode body, must have yielded up some significant fraction of its own matter for the production of positive ions required by the discharges. Electrons liberated in the ionization process would have remained with Mars, but the positive ions—the identifiable fractions of the atoms and molecules broken in the process—would have been transferred in considerable measure to the Moon. In an encounter of the type described by Velikovsky the atmosphere of Mars would certainly become highly distorted (96). Gravitational forces, electrical forces, and thermal effects could be expected to pull and push the planet's gaseous envelope in various directions. In any case, however, one would expect that the first Martian "anode" materials to be encountered by triggering electrons from the lunar cathode would be atmospheric gases. In view of this, it is most interesting and suggestive to find that Mars lacks much of the atmosphere it ought to have. The atmosphere of Mars consists of carbon dioxide and rare gases, notably argon and neon (101). If the pre-encounter atmosphere was of similar composition, we would expect electrical discharging between an anode Mars and a cathode Moon to result in a massive transfer of these gases to the Moon. It is in the nature of things for positive ions from a discharge medium to become deeply implanted in cathode surface materials (102). And what gases are found to be implanted from the outside into lunar surface materials? Precisely, carbon dioxide, argon, neon, and other rare gases (103). The accepted explanation for the surprising abundance of argon in lunar soils is rather contrived, as Velikovsky emphasized several years ago (104). Investigators found that argon-40 was too abundant to have been produced in place by the radioactive decay of potassium-40, and too abundant to have been collected from the solar wind. Therefore it is imagined to have been produced from potassium-40 deep inside the Moon, then to have migrated to the surface, and finally to have been driven into surface materials by impacting solar-wind ions. Velikovsky asked: "Is this not a most artificial explanation, especially in view of my advance claim of rich invasions of argon and neon of extralunar origin?" Almost as surprising as the great abundance of argon-40 were the lesser, but still "excessive" abundances of neon and other rare gases in lunar materials. For them, all the blame fell on the solar wind by default: "The large amounts of rare gases found in the lunar soil and breccia indicate that the solar atmosphere is trapped in the lunar soil as no other source of such large amounts of gas is known" [emphasis added] (105). And the story was much the same with carbon dioxide. Those who found this gas in lunar materials were looking primarily for elemental carbon. This they found to be concentrated near particle surfaces, as if it had been implanted, like the rare gases, from the outside. But they found more than just elemental carbon. Several teams of researchers reported (106) that carbon dioxide gas was present, as such, in the lunar fines. It clearly did not belong there, but there it was. This led to speculation that carbon dioxide thus implanted was "consistent with reactions of elemental [solar-wind] carbon . . . . with the mineral matrix" (107). But the relative abundances of oxygen isotopes in the carbon dioxide molecules did not match those of the rocks themselves. Contamination by Apollo lander rocket gases was ruled out by "the tenacity with which the CO2 is held in the samples" (108). So it was finally conceded that the matter "calls for further investigation" (109). As things stand, therefore, the situation is this: Lunar fines are rich in argon, neon, other rare gases, and carbon dioxide. None of these gases is known to be present in the solar wind, nor is elemental carbon a known constituent of that medium (110), yet somehow the solar wind is supposed to have been instrumental in their forceful implantation on the Moon. And this is not all. The reasoning has been carried full-circle, so that it is claimed that the composition of the solar wind can be inferred with confidence from the evidence in the lunar rocks. In particular, an unusual "excess" of carbon-13 with respect to carbon-12 in the lunar fines has been interpreted as evidence of a similar excess of carbon-13 on the Sun (111), even though spectroscopy of the solar atmosphere indicates nothing of the kind (112). It will be most interesting, when and if a detailed analysis of the Martian atmosphere becomes possible, to learn whether or not carbon-13-to-carbon-12 ratios there resemble those of the carbon atoms and carbon-dioxide molecules stranded in lunar rocks. For now, however, it seems highly significant that precisely those gases known to be present in the atmosphere of Mars-the great bulk of which has been mysteriously "stolen" away in the not-too-distant past-are also found tenaciously held in superficial crystalline layers of the Moon's outermost blanketing materials. This would be a most incredible coincidence if the interplanetary discharges described by Velikovsky never took place. Even though the Martian atmosphere were importantly involved in furnishing positive ions for electric discharges between Mars and the Moon, we need not suppose that the Martian surface would go unscathed. The spark streamers triggered in the atmosphere by electrons from the Moon would almost certainly reach backward, too, and very quickly establish the body of the planet as the true anode in the exchange. Typical anode effects of a destructive kind, leaving detectable markings after discharges are extinguished, include intense heating by streams of high-energy electrons (113), and erosion due to the leaching away of surface matter in the form of positive ions (114), as well as to the bulk extraction and removal of materials (115). In the first part of this paper we noted Leonard Loeb's explanation of the triggering process by which vacuum sparks are ignited and his further comment that if the electrodes in an industrial or an experimental setup are not carefully outgassed in advance, a vacuum spark will usually lead to a general breakdown of the gap in the form of a power arc-essentially a 'high-current, low-voltage discharge that persists rather longer than a spark discharge (116). In the postulated Mars-Moon discharge, even though we must imagine vacuum conditions to prevail at the cathode (the Moon), where triggering electrons are extracted only with some difficulty, we can hardly suppose that Mars, with its atmosphere, will behave as an "outgassed" electrode (anode). So it seems entirely likely that any spark channels established between the two bodies must immediately- have been transformed into arc channels. This would facilitate the enormous transfers of charge already inferred from the dimensions of lunar craters like Aristarchus and Tycho. It would likewise facilitate a drain-off of great masses of Martian atmosphere and their emplacement in lunar rocks (117). And it leads us to look for arc-anode scars on Mars; these traces, like the spark-cathode markings on the Moon, should be among the youngest features of the Martian surface. Concerning thermal effects, the Thomsons tell us (118) that a distinguishing feature of the arc discharge, due to high current densities, is the high temperature of the anode junction: "This is so high that the anode vaporizes, the vapour combines with the gas through which the arc is passing and forms a flame......... Also, anode materials can be heated to hundreds of degrees above their boiling points. It is instructive, too, to take notice of the thermal effects produced on Earth by mere lightning bolts. One such effect is the formation of fulgurites-glassy objects, usually tubular and often branching, formed in dry ground (such as dune sands) as concentrated streams of electrons funnel into the Earth from the lower ends of lightning channels (119). Another is the vaporization of surface materials, as shown by their appearance as emission features in lightning spectrograms (120). And of course the fire-ignition capabilities of lightning are well-known and too numerous to list. It remains to be added that in most cloud-to-ground lightning strikes the Earth's surface is the anode. Now, which are the youngest features on the surface of Mars? We know a lot more about this planet than we did just a few years ago, thanks to the thousands of excellent photographs taken by Mariner 9. But still this knowledge is rudimentary compared with what we know of surface details on the Moon. Therefore, any ranking of Martian features by their relative ages must for now be highly speculative and tentative. Nevertheless, by all accounts of those who have studied the Mariner 9 evidence in great detail, the great volcanoes that rise many kilometers above the surface in the Amazonis and Tharsis regions of Mars are among the youngest of Martian formations. Volcanoes surely indicate sites of intense thermal activity. Could volcanism be initiated by an arc discharge of cosmic proportions? Possibly so. In the first place, no one really knows what causes volcanism on Earth (121). Presumably the basic requirements are a source of heat and a breach in the planetary crust. Whether either or both are due to external or internal causes may well be immaterial. For example, the huge Nix Olympica structure-some 600 kilometers across at its base and standing perhaps 23 kilometers above the surrounding plain (122) has a summit "caldera" 65 kilometers in diameter that is unlike anything ever observed on Earth. It is described as "a complex multiple volcanic vent" (123), or as a complex of "successive collapse pits" (124), but it has peculiarities hard to reconcile with such explanations. Presumably, if molten materials simply welled up from a series of successive vents, flows radiating from the later vents would over-ride and at least partially obliterate the outlines of the earlier vents; in this case, however, although the later scars do deface the earlier ones, such effects are strictly local, and there is no evidence of overflowing between or among them. The idea of collapse does not seem to square with the near-perfect circularity of the pits, or with their extremely flat floors. 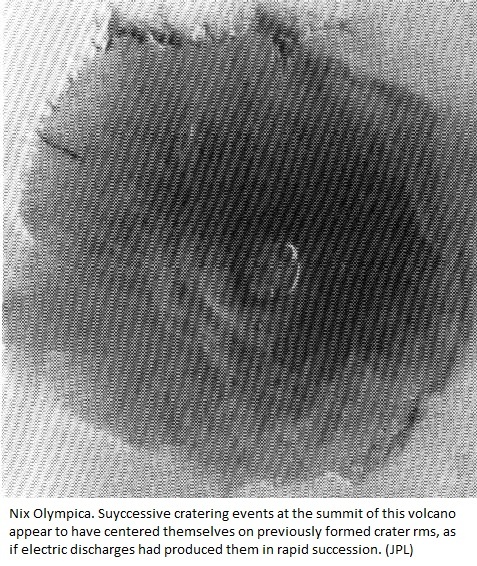 A study of Mariner 9's overhead shot of Nix Olympica suggests that the summit crater on this vast pile is indeed the result of one pit having been superimposed on another, the process repeated at least five times. But the sequence seems to run from larger to successively smaller pits in at least the first three stages, and in every case the later pits appear to be centered on rims of earlier pits. Such a seeming preference of later craters for high points on the rims of earlier ones is strongly suggestive of electrical activity. One hesitates to propose that Nix Olympica, in spite of its obvious youth, is a result of Mars-Moon discharge activity only 2700 years ago. Its bulk alone is enough to give pause to such speculation. Still, who can say what internal forces might be tapped by a thunderbolt to a body like Mars? Conceivably the heat and shock of such a strike could have been all that was necessary to produce an enormous outpouring of lava, especially from a Mars already disturbed by not-much-earlier contacts with Venus. An observation by M. H. Carr (125) may be of great significance in this connection: "Nix Olympica is unique among the Martian shield volcanoes in being surrounded by an aureole of what appears to be highly fractured terrain." Could this region have been disturbed and fractured during one interplanetary encounter, then provoked to massive volcanism during a similar encounter closely following the first? 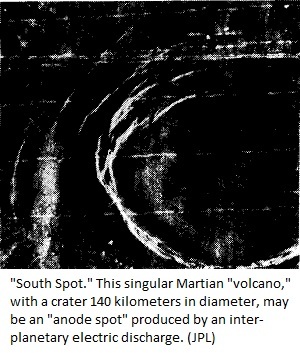 If indeed this volcano resulted from sudden triggering by a Mars-Moon arc discharge, and if the arc continued to play on it summit as it rose, occasionally shifting its focus in response to changes in the local electric field, the diminishing sizes and rim locations of the successive craters forming the present caldera would be understandable (126). The enormity of Nix Olympica, of course, makes this difficult to imagine. One is inclined to argue that any conceivable discharge of static electricity must surely burn itself out long before a mountain of molten lava equal in volume to "the total extrusive mass of the Hawaiian Islands chain" (127) could be built up beneath it. Still, given a ready-made body of magma under great pressure, the sudden shock of an interplanetary bolt, and the gravitational pull of the nearby Moon, who can say what is to limit the rate at which molten material might be delivered to the surface? It is by no means excluded, of course, that only the uppermost parts of the Nix Olympica structure were added to the pile in the final episode affecting the site. There remain several phenomenological limbs to be explored on Mars, and with the reader's indulgence I would like to climb out on each of them rather briefly. Another Martian "volcano" has features that differ from those of Nix Olympica, but which may also be suggestive of discharge origins. This is a "mountain" near Nodus Gordii that has been dubbed "South Spot" (128). It is more a crater than a mountain-an enormous pit 140 kilometers across at the crest of an impressive 17-kilometer rise from the floor of the Amazonis basin to the west (129). Both inside and outside the flat-floored crater, its otherwise remarkably smooth rim is scarred by what have been described as "multiple concentric fractures" (130) or "concentric grabens" (131). Again we have a structure with no known close counterpart among terrestrial volcanoes. Might this be the planetary-surface equivalent of what R. D. Hill has termed a "fulgamite" (132)? Discussing the effects of lightning on metal caps placed over the ends of lightning rods, Hill calls attention to "pips," or mounds of metal, "melted and raised above the surface of the metal." He describes the sides of these fulgamites as "usually ridged with closely spaced concentric grooves" and their bases as "usually flared like a bell." And he remarks: "Sometimes the position of the strike is found to wander slightly during the formation of the mound [as] shown by the shallow development of the 'borrow pits' [concentric graben?] from which the mound is built up. Hill attributes the mounding-up of fulgamites to magnetic-pinch forces at the junction of the discharge with the electrode (lightning rod). His calculations indicate that such forces in a lightning column are easily adequate to raise metallic welts a centimeter or so in diameter, and they neatly account for the bell-shaped fulgamite surfaces as well. The concentric rings and ridges, in his opinion, are best explained as remnants of ripples set up in the molten surface during fulgamite formation by oscillations in the plasma of the lightning column. But what of the great disparity in scale between the Martian feature, South Spot, and Hill's tiny fulgamites? In diameters, this amounts to at least seven orders of magnitude. As for mound heights, if we assume that South Spot's central crater resulted from subsidence of material initially mounded much higher, the difference in scale is at least five orders of magnitude. And the disparity in masses of material melted and elevated can only be guessed at, but it must be roughly proportional to the cube of the mean difference in dimensions. Is the proposed analogy even marginally reasonable? Again taking the Tycho discharge as an example, we can make some further assumptions and estimate-very, very roughly-how large the corresponding anode spot on Mars might have to be. We have 1011 coulombs of charge to accommodate, but we do not know the arrival rate. Let us guess that the discharge persisted for a full minute after the conducting channel between Mars and the Moon was established. The average discharge current in this case would have been 1011 coulombs/60 seconds = 1.7 x 109 amperes. And pushing such a current through a surface capable of accepting a current density of only 10-4 ampere per square centimeter would involve a total surface some 1.7 x 1013 square centimeters in area. This works out to a circular spot some 46 kilometers in diameter—within an order of magnitude of the size of South Spot. Obviously this kind of calculation involves many assumptions and pure guesses. But it suggests that anode scars the size of South Spot on Mars are at least conceivable in terms of the present hypothesis. As for exotic erosional features on Mars, there is almost too much variety. For now, let us simply take a brief look at a system of enormous canyons near the Martian equator. The rims of these canyons are serrated and gouged in a most peculiar fashion. Some canyons appear to be doubled, their parallel reaches separated by ridges showing similar gouging on both sides. It is estimated that some two million cubic kilometers of material was removed in the formation of the "Canyonlands" (135), yet the spoil seems nowhere in evidence on the surface of the planet. Some suggest that subsidence can explain these features (136). But to me this entire region resembles nothing so much as an area sapped by a powerful electric arc advancing unsteadily across the surface, occasionally splitting in two, and now and then-weakening, so that its traces narrow and even degrade into lines of disconnected craters (see note (126). The proportions of this vast excavation seem to put it beyond comparison with any feature of the Moon we have discussed (except, perhaps, the lunar-highland deposit that blankets more than half of the Moon). But it is well to remember that Mars tangled with Venus and with the Earth, too, according to Velikovsky. I can only wonder: Is it possible that Mars was bled of several million cubic kilometers of soil and rock in a single encounter with another planetary body? Might the Canyonlands of Mars have been created in an event perhaps hinted at by Homer when he wrote: "Athena [Venus) drove the spear straight into his [Ares' (Mars')] belly where the kilt was girded: the point ran in and tore the flesh....... [and] Ares roared like a trumpet......... (137)? It remains to be shown that the planet Mars, probably carrying twice the negative charge of the Moon as the two bodies first approached one another, could have become the anode (positive electrode) in discharge activity that followed. In private conversation at the McMaster University symposium on "Velikovsky and the Recent History of the Solar System," Professor Clement L. Henshaw of Colgate University kindly took the time to discuss this problem with me. He argued, for example, that when two negatively charged bodies are brought close together without actually making contact, there results at some point between them a mathematical "surface" of zero electric potential—an effective barrier to the transport of charge from one body to the other (138). It appears to me, however, that this argument assumes too readily that both bodies are good conductors of electricity, so that their charges reside entirely on their surfaces. In such a situation, there would be no electric field in the interior of either body, and the electric potential at any internal point would equal that of the surface. And, as the bodies were brought together, the surface charges would simply distribute themselves so that the demands of the interacting electric fields and the necessity for preserving uniform surface potentials would be simultaneously met (139). But consider what happens when a storm cloud passes over the surface of the Earth. Typically, the underside of the cloud is negatively charged. The surface of the Earth normally carries negative charge, too. Beneath the cloud, however, the Earth becomes positively charged (relative to the cloud), so that cloud-to-ground lightning delivers electrons to the Earth. And this happens even though the Earth as a whole carries net negative charge, and the cloud as a whole is probably electrically neutral. The easiest explanation is that the Earth's surface and near-surface charges are more mobile than those in the cloud; they are repelled by the electric field of the cloud, and as they flee they leave behind a region that is positive with respect to the cloud (140). The electrical situation in an encounter between Mars and the Moon might be similar to that just described. If we assume, for example, that the conductivity of the Martian surface (or some interior region where the bulk of the charge may reside) is greater than that of the Moon, it would seem likely that a "positive charge"—a relatively high potential—would be induced in a localized part of the Martian surface by the electric field of the "overhead" Moon. Martian electrons would flee the zone in question, raising its electric potential (and presumably lowering the potential of regions to which the repelled negative charges retired). 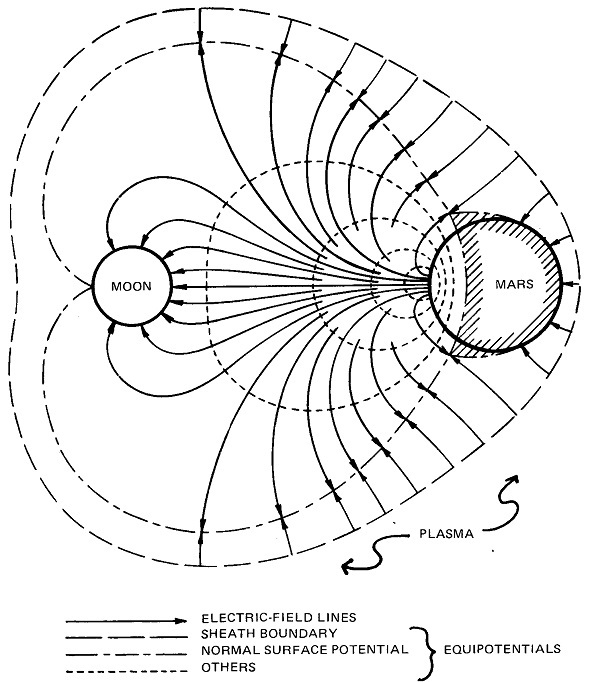 Figure 2 is a schematic representation of the kind of electric field such a sequence of events might establish between Mars and the Moon. No attempt has been made to consider distortional effects due to the nearby presence of the Earth, or confining effects due to the surrounding plasma. Nevertheless, it seems generally reasonable to expect the field lines (solid lines in the figure) to diverge from a limited, sub-lunar point on Mars and to converge upon the Moon from all directions; a critical assumption here is that the Moon's negative charges would be practically immobile until discharging got underway. Ensuing activity, of course, would quickly alter and for the most part destroy the initial field. Several other participants in the McMaster symposium in June, 1974, offered critical comments on the theme of this paper. Professor Derek York, a specialist in the radiometric dating of terrestrial and lunar rocks, had this to say concerning electrical scarring of the Moon: "If much of the sculpting of the surface was produced in this fashion, then based on the radiometric dating results. . . , these discharges must have occurred over three billion years ago and not in present times during postulated recent catastrophes." The issue raised, of course, is the validity of accepted interpretations of radiometric evidence, and this is a subject that must be dealt with elsewhere. But it bears noting that if meteoritic bombardment of the Earth and the Moon is a process that has gone on from the distant past to the present at anything like the present rate, the "freshness" of the lunar rilles and craters discussed here is exceedingly difficult to reconcile with ages of more than a few thousand years. And rays must almost certainly disappear completely in relatively short spans of time, since they are purely superficial in nature. Professor David Morrison, of the Institute for Astronomy, University of Hawaii, objected to the discharge hypothesis for its speculative extrapolations "from small-scale terrestrial effects to landforms on the Moon that are many orders of magnitude larger." This kind of argument certainly compels caution; it is difficult to imagine how one today might establish conditions capable of duplicating any of the processes proposed here on a scale that would remove all doubt. However, the same objection can be levelled at the widely accepted impact theory, which is also an enormous extrapolation from terrestrial effects observed on a very small scale; no meteorite capable of producing a large "lunar" crater has ever been observed to fall on Earth. Perhaps some support for the present ideas can be drawn from observations in which electric-discharge effects appear to be closely duplicated on scales ranging from that of tiny scars, visible only under magnification, to that of damage caused by lightning. Since the first part of this paper was written, it has come to my attention that microscopic features remarkably similar to earth-channels excavated by lightning (and to lunar sinuous rules) are produced when electrons are wrested from photographic emulsions by cathode electric fields. Loeb (141) describes these "delta ray tracks" (142) as having the appearance of "grainy dots." They are formed when "the cathode surface through the image force field of the [approaching] positive [spark] streamer gives a very heavy field across the emulsion." This strong field liberates electrons in the emulsion. "Sixteen-fold magnification indicates the dots to be small, very tortuous tracks, of lengths on the order of 0.05 mm. (emphasis added). 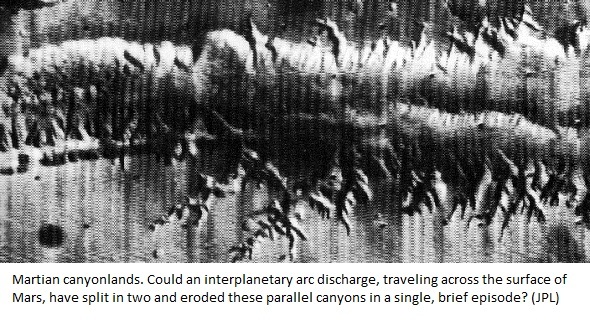 Thus, if lightning can cut "delta ray tracks" some five orders of magnitude larger than those observed in photographic emulsions (see photo illustrating Part 1 of this paper), it seems conceivable that an interplanetary discharge might duplicate the effect and magnify it another five orders of magnitude in scarring the surface of the Moon. Velikovsky's reconstruction of the recent history of the solar system indicates that electric discharges passed between planets some thousands of years ago as they encountered one another in near-collisions. If this is so, we would expect the Moon and Mars, involved in the most recent of those near-collisions, to display "fresh" surface markings interpretable as discharge scars, and this indeed seems to be the case. Furthermore, as anticipated by Velikovsky, the Moon's surface materials contain surprising abundances of precisely those gases that Mars could be expected to have planted there if it were the anode and the Moon were the cathode in electric discharges between the two planets. Viewed as a whole, the complex of evidence would appear to add considerable substance to the thesis of Worlds in Collision. (59) P. E. Viemeister, The Lightning Book (New York: Doubleday, 1961), p. 110. (60) R. B. Baldwin, The Measure of the Moon (Chicago: University of Chicago Press, 1963), Chapter 8. (61) L. B. Loeb, Journal of Geophysical Research 71, (October 15, 1966): 4711. (62) The postulated Mars-Moon potential difference of 1012 volts, spanning an interplanetary gap of 5000 km (5 X 108 cm) yields an average field strength in the gap of only 2 X 103 volts/cm, whereas it is likely that fields of 107 or more volts/cm would be required to break down lunar rock formations and produce sinuous rilles. However, local topographic features can be expected to intensify an external field at least one hundredfold. Also, as Loeb points out (Fundamentals of Electricity and Magnetism, p. 501), similar effects on a much finer scale (due to surface-roughness features too small to be seen) can further intensify electric fields by several orders of magnitude. Thus it is not too difficult to imagine an interplanetary field of only a few thousand volts per centimeter being intensified locally on the lunar surface to a point where coherent rock formations begin to succumb to the electrical stress. Overlying loose materials—fractured rock and dust, with voids permeated with tenuous gases—would have greater resistance to breakdown than a sound, underlying formation, and thus the "lightning" channel would pursue a subsurface path. (63) V. A. Bailey, Nature 186 (May 14, 1960): 508. (64) I. Michelson, Pensée 4 (Spring, 1974): 15-21. (65) R. E. Juergens, Pensée 2 (Fall, 1972): 6-12. (66) E. M. Shoemaker, R. M. Batson, H. E. Holt, E. C. Morris, J. J. Rennilson, and E. A. Whitaker, Journal of Geophysical Research 74 (November 15, 1969): 6081. (67) W. K. Hartmann and F. G. Yale, Sky and Telescope (January, 1969): 4. (68) In an article on "Measuring the Shape of the Moon," in Sky and Telescope for March, 1966, R. L. Wildey calls attention to, and reproduces, a map of the Moon prepared in 1901 by two German astronomers. On this early and rather primitive map we find Tycho in the highest region—"über 1200 Mtr." (69) Baldwin, The Measure of the Moon, Chapter II. (70) E. M. Shoemaker, et al., Journal of Geo-physical Research 74 (1969): 6081. (71) Cf. "Hot Spots on the Moon," Sky and Telescope (February, 1961): in an abstract published in the Astronomical Journal (vol. 68, p. 287), B. C. Murray and R. L. Wildey suggest that "These anomalies are possibly generated by extensive exposures of bare rock. In January, 1963 (pp. 3 and 24), Sky and Telescope reported: "Corroborative evidence for a relatively denser surface in Tycho has recently been found through infrared measurements of lunar surface temperatures (Shorthill, Borough and Conley, 1960)." (72) T. W. Thompson and R. B. Dyce report (Journal of Geophysical Research 71 [October 15, 1966]: 4843) that their radar-back-scattering studies suggest that back-scattering from Tycho is anomalously high because its floor is free of a "tenuous layer" that otherwise blankets the Moon. (73) S. H. Zisk's discussion of the flooding of crater floors with molten material from below (Science 178 [I December 19721: 977) is just one example. L. J. Kosofsky and F. El-Baz comment (The Moon As Viewed by Lunar Orbiter [Washington: NASA, 19701 p. 83): "Some geologists consider the symmetrical rings or shells surrounding the large mounds [in the floor of Tycho] to be due to the flowage of shock-melted rock off the surface of the mounds. Others interpret them as volcanic domes." Given proper conditions, perhaps each of these ideas has merit, but none of them seems convincing in context with the absence of debris from the floor of Tycho, or with the makeup of the crust in this lunar highland region. (74) J. J. and G. P. Thomson (Conduction of Electricity through Gases, Vol. II [1933, New York: Dover Publications, 1969], p. 458) point out that cathode disintegration through the expulsion (sputtering) of atoms of metal was first reported by Plücker in 1858. The cleanup process includes, in addition to the sputtering of cathode metals (an effect long in use technically in the production of semi-transparent metallic films on glass for optical purposes), the generation of considerable fine dust and of cathode-material vapors, which condense and produce fallout beyond the confines of the immediate cathode "spot" or "crater" in which a discharge burns. This last effect suggests a likely source for the Moon's ubiquitous glassy-sphere soil particles. (75) Baldwin, The Measure of the Moon, p. 351. (77) "News Notes," Sky and Telescope (July, 1966). (78) Baldwin, The Measure of the Moon, p. 355. (79) E. M. Shoemaker, "The Geology of the Moon," Scientific American (December, 1964): 38-47. (80) W. H. Pickering, The Moon (New York: Doubleday, Page and Company, 1903), p. 53. (81) E. M. Shoemaker, et al., Journal of Geophysical Research 74 (1969): 6081. (82) V. A. Firsoff, Strange World of the Moon (New York: Science Editions, 1962), p. 168. (83) The term "western" is here used in the astronautical sense. The rim of Tycho in question is therefore that side of the crater where the Sun sets. Astronomical custom, as a result of the reversal, left to right, and inversion, top to bottom, of telescopic images, would have it that this same "sunset" region is the "eastern" rim of Tycho. (84) To the best of my knowledge, Velikovsky's March 14, 1967 memorandum to the Space Board of the National Academy of Sciences (Pensée 2 [Fall, 1972], p. 28) was his first occasion to express in writing the idea that lunar rays were produced by interplanetary discharges. On July 4, 1962, I wrote to Harold C. Urey, suggesting, among other things, that the rays constitute Lichtenberg figures. His reply (July 25, 1962) struck me as the expression of a rather strange attitude for a prominent scientist: "I find it more satisfactory to admit that I do not understand a natural phenomenon at any time than to accept explanations based on other things which I also do not understand." (85) Cf. J. D. Cobine, Gaseous Conductors, p. 201. (86) Cf. S. Whitehead, Dielectric Breakdown of Solids (New York: Oxford, 1951), pp. 170-71. (87) Cf. L. B. Loeb, Electrical Coronas, pp. 189 ff. (89) For example, Lichtenberg figures can be used to measure very brief time intervals between current surges (see Cobine, Gaseous Conductors, p. 202). (90) Cf. Loeb, Electrical Coronas, pp. 189ff. (91) E. Nasser and D. C. Schroder, International Conference on Gas Discharges, 15-18 September 1970 (London: Institution of Electrical Engineers, 1970), pp. 539-43. (92) Cf. E. Driscoll, "Far Side: Study of Contrast," Science News 100 (September 18, 1971):194-95. (93) Baldwin, The Measure of the Moon, p. 236. (94) Baldwin (The Measure of the Moon, p. 355) calls attention to Pickering's early work . (1892) indicating that rays are made up of component parts, or elements, "all roughly alike"-long, narrow, elliptical sections. (95) The kind of interplanetary near-collision described by Velikovsky necessarily raises many questions as to the provenance of many different materials on all the planetary bodies involved in such encounters. In the context of Worlds in Collision, it will not do to assume, for example, that any particular material, however abundant it may be on the present surface of the Moon, is "lunar" in the sense of having originated on that body..
(96) In Worlds in Collision, Part II, Chapter 4, Velikovsky relates numerous forms ascribed to Mars by ancient peoples and suggests that distortions of the Martian atmosphere during approaches to other bodies—Venus, Earth, Moon—inspired such reports. (97) Cf., S. Glasstone, The Book of Mars (Washington: NASA, 1968), p. 86. (99) Glasstone, The Book of Mars, pp. 8790; see also B. C. Murray, "Mars from Mariner 9," Scientific American (January, 1973): 4969. (100) Cf. for example, M. H. Carr, "Volcanism on Mars," Journal of Geophysical Research 78 (July 10, 1973): 4049. (101) G. H. Kuiper reported the first firm evidence of carbon dioxide in the Martian atmosphere in 1947, although its presence had long been assumed. Velikovsky anticipated, in a lecture copyrighted in 1946, and again in Worlds in Collision (1950), the ultimate discovery that rare gases, argon and neon in particular, make up a considerable fraction of Mars' atmosphere; others postulated argon as a likely constituent, but only in minor amounts. A typical 1961 estimate of the makeup of the planet's atmosphere was this: Nitrogen-93% of molecules present; Argon-5 to 6%; carbon dioxide-1 to 2%. Infrared data secured in 1963 led to a major revision in the estimate: carbon dioxide up to between 50 to 100%. (The foregoing largely from The Book of Mars.) But in April, 1974, the Soviet Union announced that the Mars 6 lander had detected "tens of percent" of inert gases in the Martian atmosphere. The investigators concluded that argon was the most likely candidate-gas to account for this finding, with neon probably in lesser abundance. (103) Cf. various papers in Science 167 (January 30, 1970), especially in sections headed "Abundance of Major Elements" and "Stable Isotopes, Rare Gases, Solar Wind, and Spallation Products." (104) I. Velikovsky, Pensée 2 (May, 1972): 20. (105) J. G. Funkhouser, et al., Science 167 (January 30, 1970): 538; quotation from abstract. (106) Cf. I. Friedman, et al., Science 167 (January 30, 1970): 538; I. R. Kaplan and J. W. Smith, Science 167 (January 30, 1970): 541. (107) Lunar Sample Preliminary Examination Team, Science 165 (September 19, 1969): 1211. (108) I. Friedman, et al., Science 167 (January 30, 1970): 538. (109) G. Eglinton, et al., Scientific American (October, 1972): 81. (110) A. J. Hundhausen (Reviews of Geophysics and Space Physics 8 [November, 1970]: 729) lists, as the only positively identified ions in the solar wind, 1H+, 4H++, 4He+, 3He++, 16O+5, 16O+6, and 16O+7. Carbon ions are known to be present in solar cosmic radiation, but they probably originate in the lower atmosphere of the Sun, not in the corona (idem, p. 736). (111) W. Cochran, "Apollo II Lunar Science Conference," GeoTimes (February, 1970); G. Eglinton, et al.. Scientific American (October, 1972): 81. (112) Cf. C. E. Moore, "The Identification of Solar Lines," in The Sun, ed. G. P. Kuiper (Chicago: University of Chicago Press, 1953). (113) Cf. Cobine, Gaseous Conductors, p. 343. This author also points out (p. 364) that in electric-arc cutting, "the work is usually made the anode when direct current is used because of the greater heat developed at the anode." (114) J. J. and G. P. Thomson (Conduction of Electricity through Gases, p. 579) call attention to the rapid erosion of the anode in a carbon arc due to the extraction of positive ions. (115) E. J. Hellund (The Plasma State [New York: Reinhold, 1961] points out (p. 74) that "Electron bombardment of the anode surface can lead to disruption of the molecules normally resident there. . . . land] loosely bound atoms are disposed to volatilize and leave the parent lattice." (116) One notices a certain lack of definition of terms in the works of authors discussing electric-discharge phenomena. Particularly hazy is the distinction between a "spark" and an "arc.,, One author describes a spark as a transient arc. J. M. Somerville (The Electric Arc [New York: Wiley, 19601) says: "The term arc is usually applied only to stable or quasi-stable discharges, and an arc may be regarded as the ultimate form of discharge which will be reached under all conditions if the current through the gas is made large enough." He adds, however: "Attempts at rigid definitions of physical phenomena are seldom successful or helpful, and the arc is no exception. It is best to outline the characteristics of a typical arc and leave the question of the classification of marginal cases for tearoom debate." (117) Cobine (Gaseous Conductors), discussing the "Low-pressure Arc Column" (which is the probable analog of an interplanetary discharge burning in a very thin gas, such as might be drawn into a Mars-Moon gap), points out that ionization is most intense at the axis of the column and that the electric potential is also highest at the axis (with respect to other points on any cross section of the column). As a result, positive ions formed in the plasma of the column "are being continually lost to the walls of the tube" (p. 319). If we liken the general surface of the Moon to discharge-tube walls (see note 102), we can imagine a Mars-Moon arc column spraying positive ions across vast regions of the lunar surface, which, under the present postulates, would be of lower potential, thus attracting positive ions to itself. (118) Thomson and Thomson, Conduction of Electricity through Gases, vol. 2, p. 590. (119) Viemeister (The Lightning Book, pp. 138-41) discusses this process in easily understood terms. (120) Cf., L. E. Salanave, "The Optical Spectrum of Lightning," Science 134 (November 3, 1961):1395. (121) I refer here to ultimate causes. It is commonly explained that volcanism is due to rifting of the Earth's crust, which permits the establishment of "permanently open conduits" along which molten rock can rise from the mantle. Currently, geophysicists connect volcanism with "continental drift" and "plate tectonics," but it is difficult to do the same with Martian volcanism. Velikovskian catastrophism, supported by historical documentation, seems to provide as compelling an explanation of first causes as has yet been advanced. (122) Cf. M. H. Carr, Journal of Geophysical Research 78 (1973): 4049. (123) Photo caption for JPL P-13074 (Nix Olympica Mosaic), 1972. (124) M. H. Carr, Journal of Geophysical Research 78 (1973): 4049. (126) Somerville (The Electric Are, p. 89) comments: "There is usually a considerable contraction [of the arc column] at the anode and the anode spot sometimes moves over the anode surface... [and] the motion may be discontinuous, a series of spots being left on the anode instead of a continuous trace." (127) H. Masursky, Journal of Geophysical Research 78 (1973): 4009. (128) This volcano is the southernmost in a chain of high "spots" that were among the first Martian features to appear as the dust storm that greeted Mariner 9's arrival began to subside. (129) Cf. M. H. Carr, Journal of Geophysical Research 78 (1973): 4049. (130) Photo caption for JPL P-12688 (Nodus Gordii-South Spot), 1971. (131) M. H. Carr, Journal of Geophysical Research 78 (1973): 4049. (132) R. D. Hill, Journal of Geophysical Research 68 (1963): 1365. (133) Cf. Somerville, The Electric Arc, p. 89. (134) J. J. and G. P. Thomson remark (Conduction of Electricity through Gases, p. 403): "The function of the anode is to provide for the electrons striking against it a way of escape from the discharge." Concerning the carbon arc, they add (p. 579): "All observers seem to agree that the temperature of the anode reaches a value which is independent of the current. . . . An increase in current increases the area of the luminous crater......... Cf. also Cobine, Gaseous Conductors, p. 521. (135) See R. P. Sharp, Journal of Geophysical Research 78 (1973): 4063: "The major problem of trough [canyon] genesis involves disposal of about 2 x 106 km3 of material." (137) The Iliad, Book V (Translated by W. H. D. Rouse). E. Schorr suggests that imagery such as this is simply the poet's way of saying that the successes and failures of men in the warfare at Troy were credited to or blamed on the celestial gods. In the passage in question, the spear is thrown by Diomedes and redirected by Athena, then withdrawn from the flesh of Ares by Diomedes. I leave it to others to explain why, if Diomedes was indeed a mere man, he would be casting spears at a planetary god in the first place. (138) A graphic representation of this situation is to be found in Figure I among the Plates at the end of Volume I of Maxwell's "A Treastise on Electricity and Magnetism," Third Revised Edition (1891). (139) See Maxwell's Article 118 (pp. 178-79) in Volume I of the "Treastise." (140) Cf. Viemeister, The Lightning Book, p. 112. (141) Loeb, Electrical Coronas, p. 192. (142) In a footnote, Loeb explains that electrons liberated by x-rays and other types of radiation were described as "delta rays," presumably by those who first observed the phenomenon in this (photoemulsion) medium. Actually the term "delta ray" seems to have been applied earlier to a similar electron-ejection effect observed in gases; cf. J. J. and G. P. Thomson, Conduction of Electricity through Gases, Vol. 2, p. 170.